Registration opens on Sunday, Feb. 7 at the United Nations Conference Centre. Please come pick up your bag and your indentification badge as well as mix and mingle with fellow attendees at a light reception. A photo ID is required to register. All attendees must show a photo ID. Join us at 8:30 on day one as we open the SBCC Summit, where we welcome our participants. Keynote speeches will be given by Kumi Naidoo, Launch Director of the African Civil Society Center and David Neal, Founder & Managing Partner of Catalyst Behavioral Sciences LLC. Participants can visit the Exhibit Hall to view posters and take part in the tea break. View the full list of Poster Presentations with titles. Posters will be on display all day - at both the morning break and the afternoon break - on the presenter's scheduled day. Currently senior advisor, hygiene promotion & behavior change with World Vision's Global Health & WASH Team. Please talk to me about behavior change programming for WASH. and monitoring & evaluation for behavior change. The Market Fair hosts informational booths from participating organizations. Blue Sky Session: What Counts As Evidence? The Blue Sky sessions will provide interested participants with the opportunity to discuss critical questions in the field of SBCC in an open, lightly facilitated format. Highlights from each Blue Sky session will be presented at the Town Hall plenary session on February 10th at 4:00pm in Conference Room 1. What counts as evidence of communication impact? Are we focused too much on the impact of communication alone and not enough on how communication complements other strategies for change? What would make our evidence more compelling? Chancy Mauluka: From The Initiation Hut To The Clinic Via The Pulpit: A Case Of Integrating Culture, Religion And Health In Marriage Counseling. Zelalem Mekuria: Bringing Nutrition Advocacy To Orthodox Church Leaders To Raise Awareness And Change Social Norms On Fasting Practices In Ethiopia, During The First 1000 Days. I am a demographer, i work at the Minsitry of Economy, Planning and Regional Development since 2013. I obtained my M.Sc in demography in 2013. I also obtained a M.Sc in Economics in 2010. My research interests are maternal health, family planning and reproductive health rights. This is the first workshop in a three-part series on improving the sustainability of SBCC organizations. In this session, attendees will be oriented on how to use the Program for Organizational Growth, Resilience and Sustainability (PROGRES). The workshop will utilize a team-based learning-by-doing approach where each team will be given a case study to apply the CORE domains outlined in the PROGRES assessment process. Then, based on their assessment, each team will develop action plans for the organizations in their case studies. Results from each team will be presented to the larger session. The Action Media methodology, developed in the 1990s to inform HIV communication between youth in South Africa, has since been reiterated and applied to many countries, diverse audiences and a range of issues. The approach focuses on how audience representatives engage with health issues both as individuals and within small collectives and how these insights can be utilized to mobilize change. Participants will engage with Action Media case studies and discuss the methodology’s application to their work. Gender-transformative SBCC programs require knowledge of the sociocultural context in question and the gender dynamics and influences at play. In this interactive workshop, facilitators will briefly cover gender theory as well as the four qualitative research methods. Case studies from their programmatic work in family planning in Albania, WASH in Benin, integrated nutrition, agriculture and WASH in Ethiopia, and maternal health in Mali will illustrate their approaches to understanding these sociocultural contexts of behavior and gender, as well as prepare participants to assess which research method should be applied to their own formative research. The community video approach allows for audience viewers to observe practices that SBCC interventions are trying to mainstream within their local context: videos promoting healthy behaviors are led and produced by the community for the community, demonstrated in their language by someone of similar means. Facilitators of this workshop will take participants through the community video approach process, from producing, editing and dissemination, to monitoring and evaluation of these locally made videos. As the Sustainable Development Goals (SDGs) begin to see implementation, ICTs can play a key role in their achievement. The SDG ICT Playbook, produced by organizations across the public, private and humanitarian sectors, outlines how ICTs can make SDG interventions scalable, measurable and more in ways that only a few years ago would have been impossible. Participants will be taken through the SDG ICT Playbook as they begin to think through their own ICT plan development in relation to their intervention’s objectives. Comm Talks are 10-minute "TED Talk" like presentations that focus on experiences from the field (innovations, successes, challenges, and lessons learned). H.E. Dr. Kesete Birhanu Admassu, Minister of Health, Federal Ministry of Health Ethiopia, will be the guest of honor and will officially open the SBCC Summit. H.E. Dr. Kebede Worku, State Minister of the Ethiopian Federal Ministry of Health, will be chairing the official opening ceremony. Other speakers include, US Deputy Chief of Mission, H.E. Peter Vrooman and Susan Krenn, Director, Johns Hopkins Center for Communication Programs. The Roll Back Malaria Communication Community of Practice (RBM CCoP) brings social and behavior change implementing partners, national malaria control programs, donors, USAID and President’s Malaria Initiative (PMI) staff, research institutions, and private sector organizations together to further the implementation of the Strategic Framework for Malaria at the Country Level. This morning session, facilitated by CCoP Secretariat HC3, with support from USAID/PMI and the ACT Consortium, will include a welcome and a short presentation on community based SBCC for malaria in Ethiopia, an introduction to research and resources from CCoP partner ACT Consortium, and an overview of other resources the group and its partners have produced and collected. I'd love to hear from current or prospective members of the RBM CCoP about what can contribute to the international malaria SBCC community. I'd also be thrilled to answer any questions anyone might have. about the CCoP. Join us as we enter Day Two of Summit. We are expecting two engaging keynotes from consumer choice and behavior expert Matthew Willcox, and Lebo Ramafoko, Executive Director of Soul City Institute. Projects to be highlighted are from Ethiopia, South Sudan and Zambia that implemented structured community empowerment approaches to generate demand for and improve quality of health services, including general primary healthcare, MNCH and HIV/STI services. Each presenter will discuss how they identified and addressed demand drivers and barriers for quality health care through the community mobilization and empowerment process. Intervention design considerations and quantitative assessments of the impact a community’s capacity has on behavioral and health outcomes will also be addressed. Human-centered design - which prioritizes listening, empathy, prototyping and iteration in collaboration with communities - still isn’t widely applied to the creation of SBCC interventions, despite how much they rely on participatory processes. This panel’s objective is to discuss creative and community-centered SBCC interventions in Ghana, Malawi and Sierra Leone that systematically utilized human-centered design for behavior change. Panelists will also discuss how these interventions were designed for scale from the outset and rigorously evaluated to test the theory of change pathways and to document the entire design process. VP, Innovation & Strategy, Concern Worldwide U.S.
Health communication perspectives from Asia, Africa, Latin America and the West will be presented, with key theories highlighted from each and how they can complement each other. The panel will make the case for exposing communication professionals to this wider “palette” of global theories of health communication in order for them to be more effective and successful. James Deane, Director of Policy and Learning, BBC Media Action / Rachel Houghton, Executive Director, Communicating with Disaster Affected Communities Network (CDAC), Communication in Emergencies: the potential and challenges of networking and evidence. Je suis une chargée de programme basée à Baltimore avec le Johns Hopkins Center for Communication Programs. Je fais partie de l'équipe d'organisation du Sommet francopjhone pour le CSC, et travail égalemnt sur le projet CSC "Breakthrough ACTION." M. Mamadou Diouf is working for the international NGO Micronutrient Initiative (MI) as a Senior Program Officer. M DIOUF is a public health Nutritionist and Health Program Manager with fifteen years of experience in the field. Blue Sky Session: How Do We Describe SBCC? Is there a way we can describe what we all do in a way that is comprehensible to the broader community? Implements SBCC interventions in the areas of HIV, Malaria, Family Planning and Maternal Child Health. Passionate about working with young people. | Interested in approaches to closing the urban rural digital divide for SBCC in the context of Low developed countries. National Malaria Elimination Programme, Federal Ministry of Health. This panel is organized by UNICEF and the SPRING Project. Massimiliano Sani: Adaptation and Use of the Community IYCF Counselling Package in Mozambique. Charity Zvandaziva: Community IYCF Support Improves Exclusive Breastfeeding Rate among Rural Women of Zimbabwe. Hi all, I'm a 20 year champion of communication to change behavior. I'm keenly interested in seeing how SBCC will evolve to be more impactful now that we have the evidence and knowledge of what works and what doesn't. This is the second workshop in a three-part series on improving the sustainability of SBCC organizations. While the number of NGOs aspiring to move away from reliance on donors continues to increase, greater organizational sustainability depends on an organization’s ability to remain both mission-driven in the face of the shifting funding landscape as well as responsive in their resource mobilization capabilities. Using a learning-by-doing approach, workshop participants will be broken into teams that will assess organizational case studies using the Resource Mobilization Implementation Kit (I-Kit) created by the workshop facilitators with these goals in mind. Two experiential “fun and games” programs that targeted low-literacy populations, one in Tanzania and the other in Liberia as part of the Ebola response, will be highlighted as examples of a participatory SBCC training methodology that’s been used for 15 years in community health training programs worldwide. This workshop will be highly interactive and prepare participants to design and implement effective community engagement and training programs. This workshop will combine both the science behind designing effective messages as well as the art of evoking an emotional response and encouraging and empowering the message’s target audience. Facilitators’ own audiovisual and print message examples, along with messages from the commercial sector, will be shared and assessed in order to demonstrate best practices. A certificate of completion will be distributed to all attendees after the workshop. SBCC designed to improve WASH programming tends to be informed by quantitative data from baseline surveys and qualitative data from focus group discussions and in-depth interviews. While both of these methods have their advantages, both rely on self-reported behavior or their family’s or community’s behavior. The objective of this workshop is to prepare participants to employ direct observation and additional ethnographic methods of data collection which provide more insight into behaviors beyond what’s reported. Participants will use these methods on-site at the conference venue and report back their findings and assessments. Presenters will provide multimedia case studies of countries and employ an adult-learning approach to comprehensive SBCC intervention design. A variety of the Alive and Thrive Project’s program design tools will be introduced and utilized as participants go through the planning process for an intervention with four components: advocacy, interpersonal communication and community mobilization, mass communication, and the strategic use of data for delivering SBCC intervention results at scale. Joanna Murray: Can Mass Media Interventions Reduce Child Mortality? Alexandre Rideau: C'est La Vie! The Roll Back Malaria Communication Community of Practice (RBM CCoP) invites you to join the group for an evening of resource sharing and networking. This event, facilitated by CCoP Secretariat HC3, with support from USAID/PMI and the ACT Consortium, provides members with the opportunity to share resources gathered, discuss current initiatives, and learn how to become more involved in the group’s monitoring and evaluation, communication and outreach, and knowledge management task forces. The ACT Consortium will discuss toolkits being developed for NMCPs and implementing partners, the Secretariat of the CCoP will share online tools and platforms and flash drives with additional SBCC malaria evidence and resources. This will also be a time for all summit attendees present to share share malaria SBCC resources. Anyone working or interested in SBCC for malaria are strongly encouraged to attend the networking event afterwards (TBD). No invitation necessary, but please let us know if you’d like more information by contacting cfordha1@jhu.edu. Join HC3 for an event to introduce the new Springboard for Health Communication Professionals Android and iOS app. Springboard is an online social networks that connects SBCC practitioners around a variety of technical areas. This event will bring the community together in one place to explore features of the website, the mobile app as well as serve as a venue to award three lucky Springboard members a Samsung Galaxy tablet. To be eligible to win, members must sign up at the HC3 booth, attend the launch event and make a post in Springboard prior to the event. Winners will be chosen by random drawing at the event. Come and watch an episode of BBC Media Acton’s popular TV drama Ujan Ganger Naiya (Sailing Against the Tide) which is set in a rural village in Bangladesh and afactual TV show Natoker Pore (After the Drama). This will be followed by a Q&A hosted by Sophia Wilkinson, Senior Health Advisor, and Dr Faisal Mahmud, Project Director, Health, to explore why 30 million people tune in each week. We will also consider how the programs influence social and behavior change, the challenges of making the programs as well as how we used structural equation modelling to maximize impact. Join this session to view a short presentation and full screening (98 minutes) of the film Inside Story. Interactive Radio Drama is currently being used in Malawi to engage tens of thousands of people in the process of behavior change and rights-based advocacy. This event will provide an overview of IRD – what it is and how it works – as well as a chance to take part in a live broadcast simulation. A video on IRD in Malawi will also be screened. Hosted by Ryan Borcherding from Theatre for a Change. Civil society in Africa is under assault on many fronts. We are experiencing many restrictions on political space, the erosion of women’s rights, increasing inequality and, in addition, climate change which is already having significant impacts across the continent. We therefore need to increase our cooperation, solidarity and the sharing of experiences as African civil society while building our capacity to mobilise and organise our civic struggles, and to shape development agendas at the local, national and international level. It is against this background that ActionAid and CIVICUS, in collaboration with regional coalitions, have come together to discuss the proposition for establishing a dynamic and robust space where progressive and engaged African Civil Society leaders can convene. The ACSC vision is to foster an environment of democratic, equitable, sustainable and transformative change in Africa, one in which popular struggles against poverty and injustice can successfully shift the balance of power and attain respect for the human rights of all. The mission is to promote and strengthen the effectiveness of African solidarity and integration, bringing together networks to build trust and cooperation amongst Civil Society leaders, for reflection and experience sharing in pursuit of the ultimate goal of eradicating poverty and injustice. Create space for civil society organisations and social movements to coalesce ideas and build people's power as well as amplifying the collective voice of African citizenry and thus increasing their influence to challenge the status quo. Enhance leadership capacity of civil society in Africa by strengthening leaders of organizations and social movements involved in multiple struggles for a more just, democratic, equitable and sustainable world. This session will be led by Kumi Naidoo, Launch Director of the proposed ACSC, and is intended to be interactive. The Summit's final day plenary will feature two keynotes: Norkor Duah, CEO of Ghana's Lowe Lintas, and Rajiv N. Rimal, Professor & Chair in the Department of Prevention and Community Health at George Washington University. Rajiv N. RImal: Social and Behavior Change Communication at the Crossroads (and Crosshairs): What's Next? SBCC in general, special interest on the work done within Eastern and Southern Africa Region. On October 9 2015, the CORE Group’s Social and Behavior Change Working Group designed and hosted a one-day workshop to explore new and emerging ideas for M&E of SBC. The group discussed whether behavior change evaluations as currently conceived can be responsive to the dynamic background in which interventions operate, looked at the needs and dynamics driving new trends in thinking for M&E of SBC, brainstormed on-the-ground approaches and limitations to engaging audiences and communities in M&E, and discussed the implications of greater community inclusiveness. Small doable actions (SDAs) - or behaviors practical for a behavior change intervention’s target population to adopt and consistently perform in resource-constrained settings - have been a critical tool for more than 20 years. The panelists will discuss SBCC interventions reliant on SDAs, including in WASH, family planning and malaria, as well as their methodological approaches to these sectors and lessons learned, with a focus on how the SDA approach can be applied to future SBCC interventions. Danielle Naugle is a PhD candidate at the Annenberg School for Communication at the University of Pennsylvania. She is interested in researching, designing, implementing, and evaluating health communication campaigns in developing country settings. 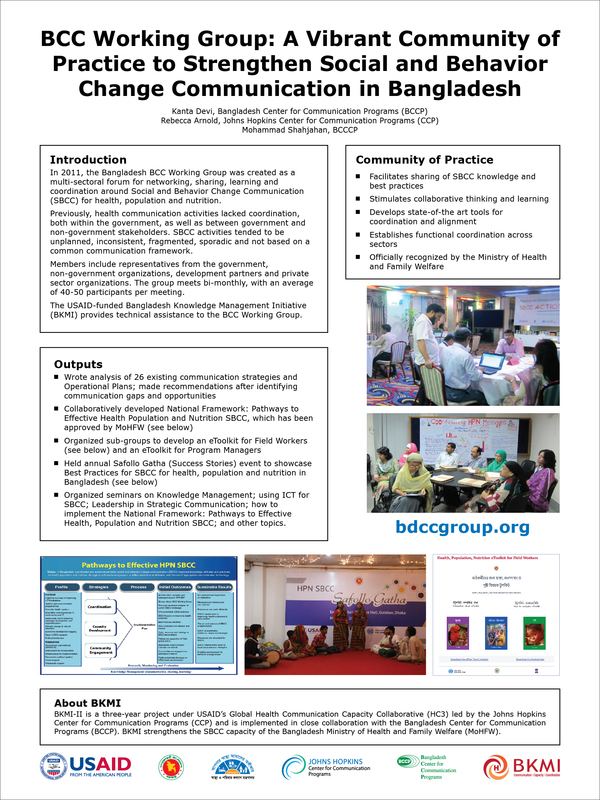 The Health Communication Capacity Collaborative (HC3) created a Demand Generation Implementation Kit (I-Kit) that addressed the need to build local and national capacity around the development of demand generation communication strategies for 13 RMNCH commodities prioritized by the United Nations Commission on Life-Saving Commodities for Women and Children Health (UNCoLSC). The I-Kit includes step-by-step guidance through the process of communication strategy design, specific details on each commodity and how strategies around gender, public-private partnerships for demand generation and the integration of ICT intersect. The panel will discuss successes and challenges of translating this global I-Kit for local contexts. Participants can visit the Exhibit Hall to take part in the tea break. View the full list of Poster Presentations with titles.Posters will be on display all day - at both the morning break and the afternoon break - on the presenter's scheduled day. Public health researcher with extensive experience in the areas of Maternal, Newborn and Child Health (MNCH), Family Planning (FP) and Reproductive Health (RH), and Monitoring & Evaluation of programs. Blue Sky Session: What Changes Can We Anticipate in SBCC? What changes can we anticipate in the next five years that will impact how we approach SBCC? Will these changes affect our efforts (positively or negatively)? SBCC Lion’s Den is a Health Communication case competitionwhere three undergraduate and/or graduate student teams won scholarships to present their proposal on specific ways to extend or add novel, innovative elements to an existing intervention, in this case, handwashing. The team with the strongest proposal and pitch will receive $5,000 to further develop their concept and implement a small-scale, six-month pilot project in their local community to demonstrate “proof of concept” and the potential for the intervention to be replicated and scaled. Come and cheer on the teams! Media and its role in promoting peace and social change. I'm a doctoral student at the Department of Health, Behavior and Society at the Johns Hopkins Bloomberg School of Public Health. I have a strong interest in entertainment education, evidence-based practice and prevention of gender-based violence. HIV prevention. Women and girls. Men and boys. Medical male circumcision. HIV testing and counselling. Research. Campaign development and implementation. Programme monitoring and evaluation. Let's talk about how over the years IEC turned into SBCC. Shalini Rozario: Immunization for Child Health! Important Information for Every Family and Community. A Speaking Book to Support Health Education on Immunization in Ethiopia. In Amharic and Oromifa. This is the third workshop in a three-part series on improving the sustainability of SBCC organizations. Partnerships and collaboration are critical components to any SBCC intervention. Too frequently, however, partners and collaborators do not possess the SBCC skills and knowledge necessary for their roles in the intervention to be most effective. This workshop will introduce participants to a wide range of SBCC tools that are designed with these “SBCC gaps” in mind and can be utilized to build the SBCC capacity of partners even when time and resources are lacking. Participants will apply these tools to case studies to determine how best they can fill in the missing skills and knowledge. Didactic learning and interactive processes will be employed in this workshop as participants are taken through a rigorous methodology of developing and utilizing edutainment materials to address social justice issues and promote positive health-seeking behaviors. Participants will work in teams to develop and present their own communication product that applies this methodology. At its heart, a story is about one of three things: People, Places or Ideas. Participants will be guided through the development of script outlines, character profiles and the overall narrative structure for visual media, particularly films and photography. Facilitators recommend that those who attend come prepared with their own story ideas or any current projects lacking compelling or completed story arcs they’d like advisement on. Most of the world’s adolescents live in low- and middle-income countries – and, increasingly, in cities. Reaching urban adolescents effectively during these formative years when their self-esteem and sexual and reproductive health (SRH) are still developing requires tailored communication patterns to suit their needs to promote healthy patterns of decision-making. Presenters will give an overview of the Health Communication Capacity Collaborative (HC3)-developed Urban Adolescent SRH SBCC Implementation-Kit and facilitate small group exercises around worksheets from the I-Kit. Participants are encouraged to bring data for an existing program to complete the exercise. During this field trip hosted by the Ethiopian Federal Ministry of Health, participants will hear about DKT Ethiopia's Higher Education Institutes (HEI) Initiative and visit the Wegen AIDS Talkline. SPACE IS LIMITED TO 20 SPOTS. Sign up now by adding this session to your schedule. Individuals can call Wegen AIDS Talkline at "952" to access free and anonymous HIV/AIDS information, counseling and referrals. Dissemination of information through the talkline equip individuals with the necessary knowledge to protect themselves from HIV, practice positive living if already HIV positive, encourage greater uptake of HIV counseling and testing, and support Ethiopians access and adhere to antiretroviral therapy. The referral component enables individuals to maneuver through the complex network of HIV/AIDS service providers and access the necessary information, care and support services they need. By providing ongoing counseling services, Wegen creates an enabling environment for those infected and affected by the virus to come to terms with it, manage undue stress, find ongoing support through referrals and improve their overall emotional well-being. The Higher Education Institutes (HEIs) Initiative is DKT/E's set of sexual and reproductive health activities targeting university students in Ethiopia. Launched in 2009, HEI is DKT/E's response to university students' heightened vulnerability to HIV and unwanted pregnancy. HEI is perhaps best known for its behavior change communication activities and social media website - Temarinet.com - one of the largest social networking platforms in Ethiopia specifically targeted towards university and college students.